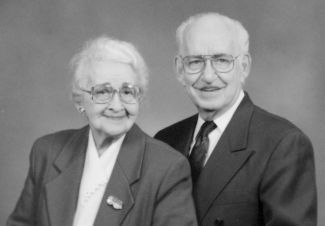 Max and Sally Allen were prime movers in the beginning and in the development of the North Manchester Historical Society. So it is very appropriate to review their lives and their contributions to this town, the Historical Society and to the broader field of art and music. Sally Mertz was born in Burnettsville, Indiana, the daughter of Charles and Elizabeth Newcomer Mertz. She graduated from Burnettsville High School and majored in Art and Music at Manchester College. She later studied at John Herron Art Institute, Art Institute of Chicago, Universidad de Autonoma de Guadalajara, Mexico, International Summer School, University of Oslo, Norway and Ball State University. Sally taught public school at Burnettsville and Idaville for 2 yrs, at Manchester College 9 years, at Syracuse, Indiana 2 years and 20 years in Chester Township, Wabash County and North Manchester Public Schools. Her creative interests were especially focused on stitchery, spinning, vegetable dyeing of animal fibers and silver smithing and jewelry. Max Allen was born in Huntington, Indiana the son of William Melvin (Mel) and Eurilla Clara Fry Allen. He graduated from Huntington High School and then from Manchester College with majors in Music, Art, Biology and English. He received a Bachelor of Fine Arts from the Art Institute of Chicago and a Masters of Fine Arts from Indiana University with majors in ceramics and silver smithing. He later studied at Universidad de Autonoma de Guadalajara, Mexico, Saterglanten Weaving School in Sweden, Arrowmont School of Crafts in Gatlinburg Tennessee. Max taught in Whitley County Public Schools for two years, and at Manchester College beginning in 1939 until his retirement, moving into Sally's position. During these years he held painting classes in many nearby towns, lectured for several seasons at the Ft. Wayne Art Museum and taught ceramics and silver smithing at Indiana University Summer School one summer. He was especially interested in spinning, vegetable dyeing, weaving and ceramics. His love of music continued through his life and many remember the delightful piano duets with Prof. Genita Speicher. He also directed and/or sang in the Methodist Church choir for many years. One special piano concert at Peabody Chapel honored Lucille Everett who was Max's first piano teacher. Both Max and Sally often appeared in Art shows or special school events to demonstrate the process of dyeing, carding, spinning many kinds of wool . They looked for a variety of dyestuffs in the countryside and used a variety of mordants such as tin, vinegar, copper sulfate, chromium and alum. The excitement of the colors that resulted never dulled. The biology study which Max did in College make it possible for him to recognize berries, barks and plants that could be used. Max and Sally were art historians. Max taught art history at the College for 39 years. That interest took them to a very special project in 1983. Sally first heard of Dan Garber, artist from his niece, Mrs. Andrew Cordier, whose husband taught at Manchester College before he went to the United Nations. Then when Dan Garber came to Manchester to do a painting of L. D. Ikenberry they met him in person. Dan Garber was born into a large family in 1880 on a farm south of North Manchester. Later, the family moved to Singer Road across from the covered bridge. He graduated from high school here and then went to study at the Cincinnati Art Academy at age 17. Further study was at the Academy of Fine Arts in Philadelphia. Garber won a prize to study in Europe and after two years there he returned to Pennsylvania in 1907. He spent the rest of his life there, living on his farm, occasionally visiting North Manchester and painting many landscapes of the Lambertville-New Hope area. He was known as one of the New Hope artists named for the area. His paintings hang in every major American museum. His painting called, "Mother and Son" is one of the more famous ones. This artist is of special interest to us for two reasons: his early life in North Manchester and the painting he did of L. D. Ikenberry who was the early long-time treasurer and business manager of Manchester College. Ikenberry's portrait hangs at the College and several years ago when a definitive biography was being prepared the College was asked to supply pictures of the painting. After much research, the Allens prepared a presentation for a meeting of the Historical Society, an article for the Society Newsletter and were interviewed for a newspaper article. Max and Sally contributed to the town in many other ways. They prepared special displays at FunFest, frequently were involved in projects to beautify the town and urged that historic buildings be preserved or restored. Their three children were all involved in art in some way: teaching, jewelry creation, ceramics, macrame, and weaving. Max and Sally spent retirement years at Timbercrest where Sally died in March, 1994 and Max in June, 2002. We are thankful for their many contributions. 130 East Main Street -- This address, as stated in the previous address, started out as a second room for Burdge Drug Store in the 1930s and earlier. In 1936 Burdge Drug Store leased the west room to Mr. Cuthbert, who opened a Benjamin Franklin dime store. Cuthbert advertised his grand opening for Saturday, December 2, 1936. The advertisement used the Burdge 132 number as the 130 East Main Street address had not been established yet. The dime store didn't make it and an ad dated November 25, 1937 indicated that they sold out. Paul's Double Dip & Grill, owned by John Paul, then moved here according to an ad dated April 28, 1938. Then a February 8, 1940 ad stated that Lawrence Curtis bought Paul's Dip & Grill. Curtis briefly kept the name and The Double Dip was a popular hangout for high school and college students. He changed the name to Curtis Grill in a May 27, 1940 ad. Then from 1942 until 1944, Ester Friend operated a sandwich shop at this address. Sometime in early 1944, Wible's Shoe Store, owned by Harry Wible, moved from the south side of Main St. (as we previously reported) to this location. Wible remained at this address for the rest of his life. Mrs. Wible moved her Uptown Beauty Shop to the rear of the shoe store. Harry was owner the remainder of our time period, but his son, Dannie Wible, took over in later years. Dannie expanded into the 132 East Main St. address when Landis Drug Store moved to the suburbs. At this writing, the shoe store is gone and the license bureau is now on the corner. 130 1/2 East Main Street - Prior to 1930, Wesley C. West had an insurance agency and real estate office on the second floor of this building. Raymond Brooks started his law practice here on July 13, 1926. Paul Beam, an insurance agent, occupied offices at this address in the 1930s. Walter Boyer advertised here in August of 1937. Sometime after 1942 the Wetzel Insurance Agency, owned by Tom Wetzel, moved to this space and advertised as late as January l, 1948. Wetzel moved to the suburbs on North Wayne Street in the 1950s. 128 East Main St. - There was a theater at this location in the early 1920s called the Gem Theater, owned by C. M. Walters. In October 1931, Mr. Walters reopened the theater and changed the name to the Ritz. In 1933 Wayne Garman took over ownership of the Ritz Theater. This Theater was here the entire period of our study. 128 1/2 East Main St. - The second floor held an office for the two theaters. However, the writer remembers taking tap dancing lessons here around 1933. This may have been before the space as used as an office, or possibly at the same time. 126 East Main St. - The Lawrence National Bank is shown at this location in the 1923 and 1924 phone books, and was here until the end of that decade. In the basement, Vernon S. Hoffman ran a barbershop with a barber named Joseph Cripe. The barbershop moved across the street about the time the bank went out of business. The Lawrence National Bank went out of business and merged with the Indiana State Bank across the street in July of 1931 and they adopted the name Indiana Lawrence Bank and Trust Company. This building was remodeled at that time. Baxter's 5 cent to $1 Store had its grand opening here on Saturday, October 10, 1931. The dime store must have been short lived, because Clarence Helvey and Earl Scott announced the opening of the Marshall Theater here on September 2, 1934. Wayne Garman, who owned the Ritz Theater, later acquired the Marshall Theater -- possibly when a "new management" ad was run on March 4, 1935. The Marshall Theater remained here for the rest of our study period, and actually outlasted the Ritz. A point of historical significance: Thomas R. Marshall, Vice President of the United States and formerly governor of Indiana, was born in a dwelling at this location. Thus the name of the theater. There is a plaque on the west edge of this building; it marks where the east side of the Marshall dwelling stood. (The house actually stood to the west in the space occupied by 124 (East) Main Street.) The house has been moved several times. Thanks to a group of local citizens and their regard for history, the house has been restored to its original state in a final location on Market Street, for future generations to visit. 126 -128 -130 - 132 East Main St. - These four addresses had a covered alley behind them that was entered on Walnut Street, which made their fire floors shallower than those of the buildings to the west. The second floors extended above the alley to connect to the first building facing Walnut Street, which was owned by Burde on the corner. It should also be noted that a hallway, on the second floor above this alley on the Walnut Street side, extended all the way behind the four buildings over the alley and connected to Main Street via a stairway on the west side of 126 (East) Main Street. 124 East Main St. - The Oppenheim Department Store was established in 1876 at 114 East Main Street. The owner and founder was Jacob Benjamin Oppenheim and the store was originally called Oppenheim's New York Cheap Store. Jacob died in 1883 and his son Ben Oppenheim, only about 14 at the time, and Jacob's widow operated the store. Ben's brother, Isaac Oppenheim, bought his mother's interest in 1892 and the name was changed to B. Oppenheim and Co. The brothers moved the store to 124 E. Main Street in 1901. 124 1/2 East Main St. - Dr. Charles Wright, father of attorney Eldon Wright, was a dentist at this address above Oppenheim's and advertised from 1931 to 1941. 122 East Main St. - While continuing to occupy the previous address, Ben and Isaac Oppenheim leased this address when David Frame moved to Walnut Street in 1905. During our study period, the east storefront was the men's store and the west storefront carried lady's clothing and yard goods. Ike sold his interest in the store to Ben in the 1920s and traveled the state of Indiana selling wholesale men's clothing to men's stores and department stores. Ben's son, Gene J. Oppenheim, ran the store for a number of years until his death on April 4, 1949. Ben remained very active in the store and actually outlived Gene, passing away on January 31, 1950. Gene's son, Philip A. Oppenheim, owned the store most of the rest of the century. Oppenheim's Department Store was a fixture in the community for many years and remained open until shortly before the end of the 20th century. During our time period, the store occupied a double front that included 124 East Main St. Beyond our time frame, they also occupied the next address, 120 East Main St. At this writing, the entire location - including 120 East Main St. - is occupied by the North Manchester Historical Society. 120 East Main St. - In the early part of the century, this address housed a hardware store with a number of owners. When Charles B. Frame sold his interest in a hardware store with his brother, Gus, to Ivan B. Little, it was Charles' intent to retire. However, in the late 1920s he opened Main Street Hardware at this address for a few years and closed in April, 1930. For the rest of our time period, Public Service Company of Indiana was at this address. Morris L. Carmichael managed PSC starting in 1937. Then Ralph Agnew became manager in June of 1941 and remained for the rest of our time period. Customers could pay their electric and gas bills at this location. In the early days, PSC also sold major appliances. On October l, 1945 the electric and gas companies separated and the gas company moved to the south side of Main Street, but not until 1946. It should be noted that Merilee Hoffman, widow of barber Vern Hoffman, lived in the back part of the second floor and worked as a seamstress. She did alterations for the Style Shop on Walnut Street in later years. This building was next to the alley and access to the second floor was via an open iron fire escape stairway on the side of the building. 120 1/2 In 1930 Jacob Lorenze had his jewelry store in this second floor address. He advertised in the 1930 Manchester College Annual as located above Main Street Hardware, which was at 120 East Main Street at the time. Martha Marie's Beauty Salon, owned by Martha Marie Reiken, was here later and first advertised on September 12, 1935. Martha Marie's sister-in-law Grace Reiken worked in the shop at some point. There is a picture of the beauty shop in the 1938 film. Attorney John F. Kelton moved into this building from next door in 1935 and stayed until his death on September 4, 1939. His daughter, Sarah Kelton Cline, passed the bar in 1937 and joined her father in the partnership of Kelton & Cline. After John's death, the name changed to Sarah Kelton Cline. When Sarah married in 1950, the name changed again to Sarah Kelton (Cline) Browne. Dr. Forrest A. Hornaday, dentist, was in this building for years. Attorney Raymond Brooks, Equitable Life Insurance agent Paul Beam and insurance agent Basil Bunyan, all advertised their new offices on the second floor on September 29, 1938. Dr. O. G Brubaker was also in this building for a period of time. Most of these tenants were here in the 1930s, except Sarah Kelton Browne who remained for the rest of our time period. 116 East Main St. - This address housed the post office from 1885 to August 1904. At the beginning of our study, attorney John F. Kelton was here until he moved to the Union Trust building next door in 1935. In 1930, Mr. Kelton advertised at this address as successor to attorneys Lloyd F. Gates and Lon D. Fleming. Grace Wright advertised her public stenographer skills in 1930, undoubtedly occupying space in Mr. Kelton's office. John Isenbarger Real Estate Agency, operated by John Isenbarger, was at this address until the early 1940s. Mr. Isenbarger became the postmaster in July, 1935, but continued to occupy this address. The Wetzel Insurance agency advertised here on February 23, 1942. George F. Rody placed an ad on July 10, 1946 as State Farm Insurance agent, replacing Ralph Weber. In an ad dated January 16, 1950 Michelle Shoe Repair shop was here, which finishes off our time period. At some point after 1950, attorney Eldon Wright bought and remodeled this building and occupied it as a law and real estate office. It is presently a real estate office again. 114 East Main St. - The original Jacob Oppenheim store was here in 1875 until 1901. Also before our study period, Olinger and Warvel had a bicycle shop here in 1914. Hazen Lautzenhiser advertised his restaurant in the 1930 high school annual. Fred Hickman, Joe Mosier, and Sam Maybe purchased the restaurant and advertised as H. M & M. Cafe in a November 7, 1938 ad. Joe Mosier left in 1941 and bought the Main View Tavern. Fred and Sam became the owners and called it Hickman and Maybe. On Wednesday, April 28, 1941 Sam Maybe sold his interest in the restaurant and Fred Hickman became the sole owner. Fred then sold the restaurant to Bert Lavengood in 1946. Bert owned the restaurant at least until an ad on December 16, 1948. Harry Wible started a poolroom and domino room in very late 1948, in this former restaurant, and operated into the 1950s. Wendel Floor Covering, owned by Paul Wendel, was at this address outside of our time frame, and included 112 East Main Street as well. 112 East Main St. - The News Journal was listed in the 1923 phone book at this address and remained here until 1944. The paper acquired its name in 1920 when The Journal, started in 1873, and The News, started in 1904, merged. Elsewhere, the first paper in North Manchester was The Advertiser in 1865, then Union Banner in 1867, next Exchange Globe in 1869, Manchester Republican in 1872 that was sold to The Journal that merged with the News and became The News Journal. A News Journal article dated June 29, 1944 announced the paper's move to 112 West Main Street. The article further advised that there would be no paper published on July 3 so that the presses could be dismantled and moved to the new location. W. E. Billings, who went by the name of Josh, became publisher and editor in 1900. He sold the paper to Roland Schmedel and Elwood B. Dunlavy in October, 1936, as reported in an October l, 1936 article. They remained publisher and editor of the paper for the rest of our study period and beyond. Both gentlemen came from the Indianapolis Star. Mr. Schmedel was the editor and Mr. Dunlavy was the business manager. Harry L. Leffel was a reporter and columnist for the paper from December 1914 until he retired 52 years later in 1966. Armstrong Electric & Appliance Sales moved into this building and announced their opening in an ad dated November 2, 1944. An article dated January 3, 1949, stated that Armstrong Electric was going out of business. Then on March 10, an ad says that A. L. Morey & Son purchased the business. The new owner must have continued to use the old name, because we found an ad for Armstrong on January 19, 1950. Then Armstrong had a going out of business sale, per an ad dated April 20, 1950. Bill Davis and his wife Helen had a grand opening for their infant's wear and gift shop here on Friday and Saturday, June 16 and 17, 1950. Coleman Manchester Printing advertised at this address in the Manchester College annual in 1948, '49, and '50. As you can see, we also have Armstrong Electric for two of these years and then Davis in 1950 at this same address. We have concluded that the ad transposed the number "121" to "112" and that Coleman was not at this address. We found other instances of transposed numbers. Well beyond our time period, Louie Johnson moved his sporting goods store here from across the street in about 1986, and was here for many years. 110 East Main St. - On February 7, 1946 Charles W. Bundy and Zainard P. Layman announced the opening of Manchester Appliance Co. Layman Appliance ran an ad in the 1947 high school annual. Earlier occupants of this address have eluded us. We speculate that perhaps this address was combined with 108 East Main Street as the poolroom because we find no occupants here while the poolroom was in existence. 108 East Main St. - This was the H. E. Lautzenhiser Restaurant in early years. Then it was Floy Simms' Pool Room, owned by Floyd E. Simms. A May 5, 1941 New Journal article reported that Mr. Simms sold the poolroom to Sam Maybe on Friday, April 30, 1941. We believe Sam kept the poolroom for a period of time in the 1940s. We have not been able to determine what was at this address after the poolroom, but a printing company presently occupies it. 106 East Main St. - Isaiah Wright owned Isaiah Wright's Feed Store here in the early 1930s. Then we found ads for Manchester Heating and Plumbing from 1934 to 1942. A November 7, 1938 ad showed this address. A 1939 College Aurora ad showed H. F. Smith, owner. Kennedy Tire Service, owned by C. O. Kennedy, started out across the river and then it was moved here as indicated by an ad on February 14, 1944. The News Journal reported on February 28, 1946 that Mr. Kennedy sold the business to his son-in-law, A. R. Niblett, who kept the Kennedy Tire Shop name. During World War II, the shop recapped treads on tires that were worn smooth but still had good casings. Reclaimed old tires were used for this purpose. Niblett was here for the rest of our time period, but later moved out and onto West S. R. 114. 102 - 104 East Main St. - Two frame buildings that occupied 102 and 104 East Main Street burned down and were never rebuilt. We have no record of the date, but it was many years prior to our study in the very early history of the town. Standard Oil Company erected the first filling station in North Manchester at this address. Prior to that, gasoline had been sold at pumps outside groceries and other stores. Russell L. Michael owned Mike's Standard Oil Station. Mike was a fixture in the community, at the same location well beyond the period of time we are addressing. Harry Leffel, in his 1965 writings, places Mike here in 1925. Today this address is a restaurant. During our period of time, the city scale for weighing loaded trucks was along Market Street out in front of Mike's station. Lots of important business was on the agenda at the July,1972 meeting of the North Manchester Historical Society. The Historical Society was in its infancy, and there were many things to get organized. The articles of incorporation were approved and J. W. Daggett was named the resident agent. Directors were Dr. L. Z. Bunker, William H. Posten, Mary Louise Little, Max and Sally Allen, Mrs. Liegh Freed and Mrs. Stewart Hawley. L. W. Shultz reported on several projects: the family histories being prepared by Arden and Donald Strauss, Philip Oppenheim, Donald Garber and Mrs. Robert Hoover; the tours of Heckman Bindery scheduled for two days during FunFest week and he received recognition for preparing a historical brochure for distribution during FunFest. Mary Louise Little said that money raising would begin by selling postcards of the covered brige and bumper stickers noting the l00th anniversary of the bridge. Mrs. Dan Speicher will direct the youth selling bumper stickers on the streets. Other fund-raising items to be sold include ceramic and metal trivets, coasters and notepaper. Bill Poston reported that the bridge float would be built by Richard Frantz of Manchester Builders, and that Frantz Lumber Company has agreed to construct and contribute ten signs designed by Allen White to be placed at Historic homes in town. Perhaps the climax event of the evening was the presentation of what was described as "its first real piece of property from Dr. Mary K. Peabody." Given at the first gift was an antique Mason-Hamlin pump organ which may have been in the old Lutheran church at one time. As Max Allen played the organ the society members sang "Indiana" and "On the Banks of the Wabash." Second was a letter from Thomas Marshall's wife to Ms. Peabody's mother at the time of the dedication of the Thomas Marshall school. Third was an article published in New York at the time of Marshall's death. These last two items had been framed by the Allens . In the 35 years since that important meeting the items of "real property" which have been given to the Historical Society by people interested in preserving the history of this town have grown into the thousands. Now as the time nears when we can all see most of that collection displayed for the education and pleasure of our children and ourselves we can be thankful to the one who started the collection and all who have contributed and to all who have had a part in preserving them through the years. After nearly giving up on finding a picture of Sally and Max Allen together, by a stroke of luck, Martha Miller happened to find such a picture as she was searching through her extensive collection of pictures. The lateness of this issue should be attributed to the editor due to this lengthy search and other commitments. The photo of Max and Sally was taken on March 19, 1993 on the 80th birthday of Max Allen. FYI - The Newsletter is Compiled by A. Ferne Baldwin and Edited by Jim Streator.